Christine Savidge, DVM, DACVIM, is an assistant professor at Atlantic Veterinary College at University of Prince Edward Island in Charlottetown, Prince Edward Island. She studied feline anaplasmosis while working at Angell Animal Medical Center in Boston, Massachusetts. Her interests are teaching and infectious disease. 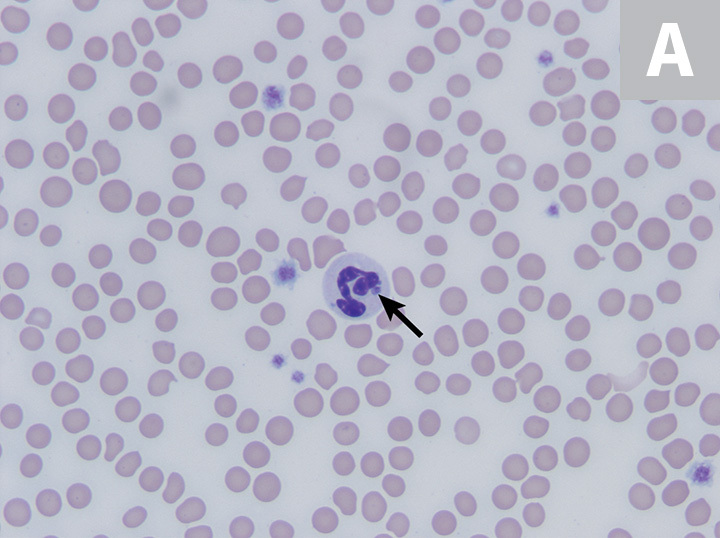 Granulocytic anaplasmosis, an acute disease that affects dogs, cats, and other mammals, results from infection with the bacterium Anaplasma phagocytophilum and is transmitted primarily by the bite of an Ixodes spp tick. Risk for exposure and/or infection is increased in animals that live in an Ixodes spp-endemic area, receive acaricidal medications inconsistently, and have increased outdoor access, particularly to natural tick habitats. Transmission to mammals occurs within 24 to 48 hours of tick attachment.25,26 Disease prevalence corresponds with increased Ixodes spp tick activity and is therefore highest in the late spring and autumn. Seropositive prevalence is increased in older dogs and cats, as these animals have had more years of exposure.1,7,12,19 Prevalence of exposure to A phagocytophilum and incidence of clinical disease are not equal. Most dogs that test positive for A phagocytophilum infection have no history of clinical illness, and cats that test positive for A phagocytophilum serum antibodies may not have signs of clinical disease.12,27 This discordance complicates testing and confirmation of disease. Have you ever seen clinical anaplasmosis in any of your patients? Making an accurate clinical diagnosis can be challenging, as many dogs and cats that are exposed to A phagocytophilum do not develop clinical disease.12,27 Determining whether an animal’s signs are attributable to active infection requires a multimodal approach to diagnosis.2 Diagnosis of acute granulocytic anaplasmosis should include consistent history and clinical signs, as well as support from CBC results, with direct visual examination of a blood smear, serology testing for specific antibodies, and PCR testing. A number of commercially available serology tests (eg, ELISA, immunofluorescence assay) that assess for specific antibodies against A phagocytophilum surface proteins are readily available, accurate, and cost-effective.35-37 It is important to note that antibodies will be absent or delayed in an acute infection, will appear 14 days postexposure, and will be consistently present 30 days after exposure.35 If a patient is suspected of having granulocytic anaplasmosis but has a negative serology test result, additional testing (eg, conventional or real-time PCR of peripheral blood, recheck serology 4 weeks later) is warranted. A positive test result confirms exposure to the organism and should also be present with clinical signs before making a clinical diagnosis of anaplasmosis. In addition to identifying intragranulocytic morulae on visual examination of a blood smear, identifying bacterial DNA in peripheral blood through PCR testing can confirm the presence of the organism directly in the blood.1,12,38 Peripheral blood can be positive on PCR testing as early as 2 days postexposure and can persist for up to 2 months, even in the absence of clinical signs.34,35,39,40 Antibiotics administered before PCR testing can cause false-negative results for detecting morulae or bacterial DNA in peripheral blood; antibody detection through serologic tests, however, is not affected by previous treatments.2,34,41 In addition to specific testing for A phagocytophilum and a positive response to treatment,20 other causes of clinical signs and clinicopathologic abnormalities should be ruled out to complete the diagnosis of granulocytic anaplasmosis. Prognosis is excellent in patients in which disease and/or coinfection is identified and treated early. Patients that have ongoing exposure to Ixodes spp ticks are at risk for re-exposure. Granulocytic anaplasmosis is best prevented by maintaining stringent tick control, reducing exposure to tick habitats, using tick repellents regularly, and having patients screened regularly for ticks after outdoor activity. No vaccines for disease prevention are currently available. Most dogs and cats respond to treatment and have no residual signs that require follow-up. If significant hematologic abnormalities are present, a recheck examination 14 days after initiating treatment is warranted to assess response to therapy. Idiosyncratic hepatic injury secondary to doxycycline administration has been described46; therefore, a serum liver panel obtained 5 to 7 days after initiating treatment may be warranted. If clinical signs persist or a patient is presented with a more complicated condition (eg, immune-mediated hemolytic anemia, immune-mediated polyarthropathy, meningitis) or develops new signs, re-evaluation should be scheduled based on individual patient needs and concurrent condition(s). Granulocytic anaplasmosis should be included on the differential list for any dog or cat that has been exposed to Ixodes spp ticks and has acute or intermittent signs of lethargy, anorexia, and/or fever and a history of receiving inconsistent tick prevention. Greig B, Asanovich KM, Armstrong PJ, Dumler JS. Geographic, clinical, serologic, and molecular evidence of granulocytic ehrlichiosis, a likely zoonotic disease, in Minnesota and Wisconsin dogs. J Clin Microbiol. 1996;34(1):44-48. Carrade DD, Foley JE, Borjesson DL, Sykes JE. Canine granulocytic anaplasmosis: a review. J Vet Intern Med. 2009;23(6):1129-1141. Egenvall AE, Hedhammar AA, Bjöersdorff AI. Clinical features and serology of 14 dogs affected by granulocytic ehrlichiosis in Sweden. Vet Rec. 1997;140(9):222-226. Mrljak V, Kuleš J, Mihaljević Ž, et al. Prevalence and geographic distribution of vector-borne pathogens in apparently healthy dogs in Croatia. Vector Borne Zoonotic Dis. 2017;17(6):398-408. Lee SH, Kim N, Kwak D. First clinical case of canine granulocytic anaplasmosis in Korea and genotypic analyses of Anaplasma phagocytophilum. Ticks Tick Borne Dis. 2017;8(4):462-465. Silveira JA, Valente PC, Paes PR, Vasconcelos AV, Silvestre BT, Ribeiro MF. 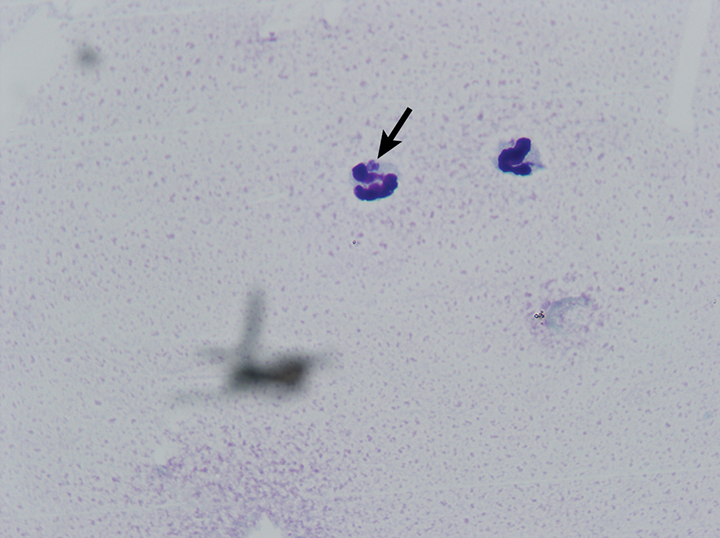 The first clinical and laboratory evidence of co-infection by Anaplasma phagocytophilum and Ehrlichia canis in a Brazilian dog. Ticks Tick Borne Dis. 2015;6(3):242-245. Bjöersdorff A, Svendenius L, Owens JH, Massung RF. Feline granulocytic ehrlichiosis—a report of a new clinical entity and characterisation of the infectious agent. J Small Anim Pract. 1999;40(1):20-24. Fine AB, Sweeney JD, Nixon CP, Knoll BM. 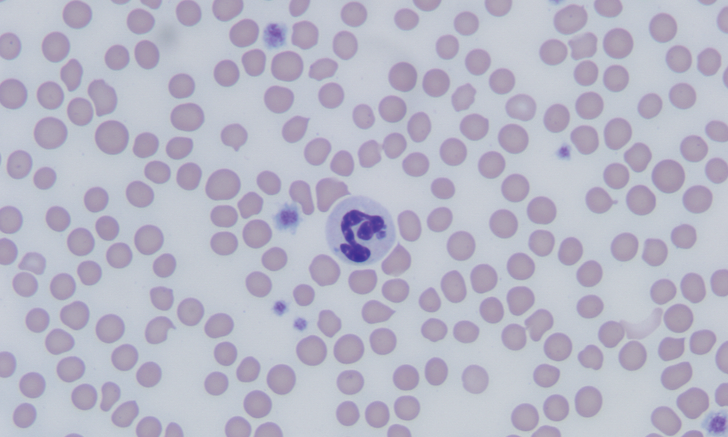 Transfusion-transmitted anaplasmosis from a leukoreduced platelet pool. Transfusion. 2016;56(3):699-704. Jäderlund KH, Egenvall A, Bergström K, Hedhammar A. Seroprevalence of Borrelia burgdorferi sensu lato and Anaplasma phagocytophilum in dogs with neurological signs. Vet Rec. 2007;160(24):825-831. Beall MJ, Chandrashekar R, Eberts MD, et al. Serological and molecular prevalence of Borrelia burgdorferi, Anaplasma phagocytophilum, and Ehrlichia species in dogs from Minnesota. Vector Borne Zoonotic Dis. 2008;(8)4:455-464. Nieto NC, Foley J. Meta-analysis of coinfection and coexposure with Borrelia burgdorferi and Anaplasma phagocytophilum in humans, domestic animals, wildlife, and Ixodes ricinus-complex ticks. Vector Borne Zoonotic Dis. 2009;9(1):93-102. Nyarko E, Grab DJ, Dumler JS. Anaplasma phagocytophilum-infected neutrophils enhance transmigration of Borrelia burgdorferi across the human blood brain barrier in vitro. Int J Parasitol. 2006;36(5):601-605. Hoyt K, Chandrashekar R, Breitschwerdt E, Lappin MR. Anaplasma phagocytophilum and Borrelia burgdorferi antibodies in naturally exposed cats in Maine. Paper presented at: American College of Veterinary Internal Medicine Forum; June 3-6, 2014; Nashville, TN. McMahan CS, Wang D, Beall MJ, et al. Factors associated with Anaplasma spp seroprevalence among dogs in the United States. Parasit Vectors. 2016;9:169. Qurollo BA, Chandrashekar R, Hegarty BC, et al. A serological survey of tick-borne pathogens in dogs in North America and the Caribbean as assessed by Anaplasma phagocytophilum, A platys, Ehrlichia canis, E chaffeensis, E ewingii, and Borrelia burgdorferi species-specific peptides. Infect Ecol Epidemiol. 2014;4:24699. Billeter SA, Spencer JA, Griffin B, Dykstra CC, Blagburn BL. Prevalence of Anaplasma phagocytophilum in domestic felines in the United States. Vet Parasitol. 2007;147(1-2):194-198. Kohn B, Galke D, Beelitz P, Pfister K. Clinical features of canine granulocytic anaplasmosis in 18 naturally infected dogs. J Vet Intern Med. 2008;22(6):1289-1295. Tarello W. Microscopic and clinical evidence for Anaplasma (Ehrlichia) phagocytophilum infection in Italian cats. Vet Rec. 2005;156(24):772-774. Domingos MC, Trotta M, Briend-Marchal A, Medaille C. Anaplasmosis in two dogs in France and molecular and phylogenetic characterization of Anaplasma phagocytophilum. Vet Clin Pathol. 2011;40(2):215-221. Santos HA, Pires MS, Vilela JA, et al. Detection of Anaplasma phagocytophilum in Brazilian dogs by real-time polymerase chain reaction. J Vet Diagn Invest. 2011;23(4):770-774. Lee S, Kim N, Kwak D. First clinical case of canine granulocytic anaplasmosis in Korea and genotypic analyses of Anaplasma phagocytophilum. Ticks Tick Borne Dis. 2017;8(4):462-465. Fukui Y, Ohkawa S, Inokuma H. First molecular detection and phylogenetic analysis of Anaplasma phagocytophilum from a clinical case of canine granulocytic anaplasmosis in Japan. Jpn J Infect Dis. 2018;71(4):302-305. Hodzic E, Fish D, Maretzki CM, De Silva AM, Feng S, Barthold SW. Acquisition and transmission of the agent of human granulocytic ehrlichiosis by Ixodes scapularis ticks. J Clin Microbiol. 1998;36(12):3574-3578. Katavolos P, Armstrong PM, Dawson JE, Telford SR 3rd. Duration of tick attachment required for transmission of granulocytic ehrlichiosis. J Infect Dis. 1998;177(5):1422-1425. Galemore ER, Labato MA, O’Neil E. Prevalence of Anaplasma phagocytophilum infection in feral cats in Massachusetts. JFMS Open Rep. 2018;4(1):2055116917753804. Granick JL, Armstrong PJ, Bender JB. 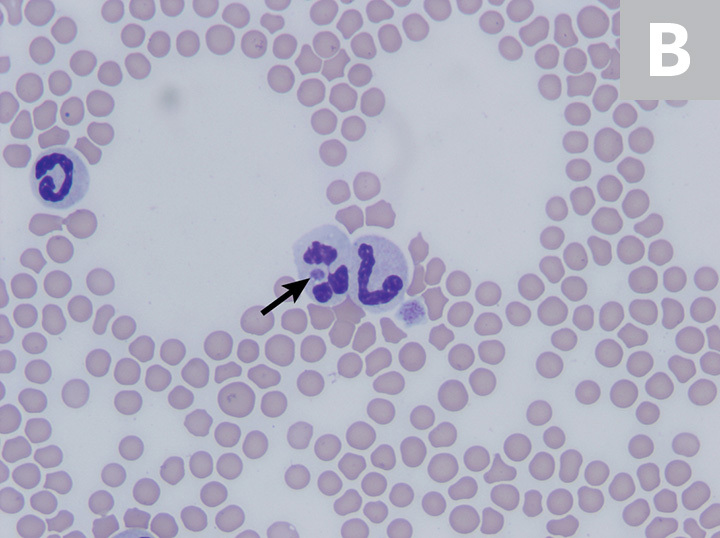 Anaplasma phagocytophilum infection in dogs: 34 cases (2000-2007). J Am Vet Med Assoc. 2009;234(12):1559-1565. Chirek A, Silaghi C, Pfister K, Kohn B. Granulocytic anaplasmosis in 63 dogs: clinical signs, laboratory results, therapy and course of disease. J Small Anim Pract. 2018;59(2):112-120. Eberts MD, Vissotto de Paiva Diniz PP, Beall MJ, Stillman BA, Chandrashekar R, Breitschwerdt EB. Typical and atypical manifestations of Anaplasma phagocytophilum infection in dogs. J Am Anim Hosp Assoc. 2011;47(6):e86-94. Honsberger NA, Six RH, Heinz TJ, Weber A, Mahabir SP, Berg TC. Efficacy of sarolaner in the prevention of Borrelia burgdorferi and Anaplasma phagocytophilum transmission from infected Ixodes scapularis to dogs. Vet Parasitol. 2016;222:67-72. Wengenmayer C, Williams H, Zschiesche E, et al. The speed of kill of fluralaner (Bravecto™) against Ixodes ricinus ticks on dogs. Parasit Vectors. 2014;7:525. McCall JW, Baker CF, Mather TN, et al. The ability of a topical novel combination of fipronil, amitraz and (S)-methoprene to protect dogs from Borrelia burgdorferi and Anaplasma phagocytophilum infections transmitted by Ixodes scapularis. Vet Parasitol. 2011;179(4):335-342. Lappin MR, Chandrashekar R, Stillman B, Liu J, Mather TN. Evidence of Anaplasma phagocytophilum and Borrelia burgdorferi infection in cats after exposure to wild-caught adult Ixodes scapularis. J Vet Diagn Invest. 2015;27(4):522-525. Moroff S, Sokolchik I, Woodring T, Woodruff C, Atkinson B, Lappin MR. Detection of antibodies against Anaplasma phagocytophilum in dogs using an automated fluorescence-based system. Vet J. 2014;202(2):348-352. Ravnik U, Tozon N, Smrdel KS, Zupanc TA. Anaplasmosis in dogs: the relation of haematological, biochemical and clinical alterations to antibody titre and PCR confirmed infection. Vet Microbiol. 2011;149(1-2):172-176. Liu J, Eberts M, Bewsey H, O’Connor TP, Chandrashekar R, Breitschwerdt EB. Sensitivity and specificity levels of two rapid assays for antibodies to Anaplasma spp in dogs. J Vet Diagn Invest. 2018;30(2):290-293. Drazenovich N, Foley J, Brown RN. Use of real-time quantitative PCR targeting the msp2 protein gene to identify cryptic Anaplasma phagocytophilum infections in wildlife and domestic animals. Vector Borne Zoonotic Dis. 2006;6(1):83-90. Chandrashekar R, Beall MJ, Thatcher B, Saucier JM, Tyrrell P, Lappin MR. Serologic responses to peptides of Anaplasma phagocytophilum and Borrelia burgdorferi in dogs infested with wild-caught Ixodes scapularis. Vet J. 2017;226:6-11. Scorpio DG, Dumler JS, Barat NC, et al. Comparative strain analysis of Anaplasma phagocytophilum infection and clinical outcomes in a canine model of granulocytic anaplasmosis. Vector Borne Zoonotic Dis. 2011;11(3):223-229. Yancey CB, Diniz PPVP, Breitschwerdt EB, Hegarty BC, Wiesen C, Qurollo BA. Doxycycline treatment efficacy in dogs with naturally occurring Anaplasma phagocytophilum infection. J Small Anim Pract. 2018;59(5):286-293. Frowde PE, Battersby IA, Whitley NT, Elwood CM. Oesophageal disease in 33 cats. J Feline Med Surg. 2011;13(8):564-569. Adaszek Ł, Górna M, Skrzypczak M, Buczek K, Balicki I, Winiarczyk S. Three clinical cases of Anaplasma phagocytophilum infection in cats in Poland. J Feline Med Surg. 2012;15(4):333-337. Companion Animal Parasite Council. Ehrlichia spp. and Anaplasma spp. https://capcvet.org/guidelines/ehrlichia-spp-and-anaplasma-spp. Published June 1, 2015. Accessed February 2, 2019. Plumb DC. Doxycycline. In: Plumb DC. Plumb’s Veterinary Drug Handbook. 8th ed. Ames, IA: Wiley Blackwell; 2015;365-369.